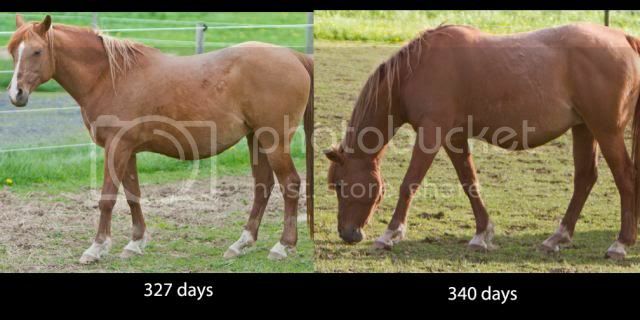 Well, most of you have watched this process from the start in Baskette's Breeding Blog in the Breeding forum and its time to start her Foal Watch thread!! We're at day 327 today. She's just starting to get udder development. The foal is active; watched it do an impressive tap dance this morning and the poor mare literally has bite marks in her flank from biting herself! She's eating great, feeling pretty good and now its just hurry up and wait. The foaling stall is cleaned out; just need to remove the center partition and get the cameras up. I don't have appropriate Internet to offer a MareStare option, but we'll certainly keep you updated. 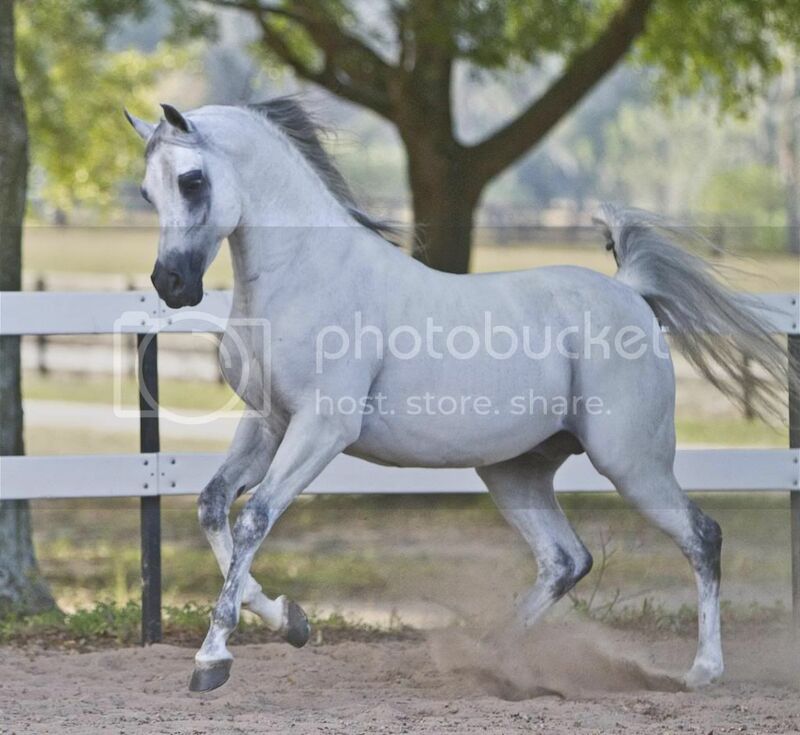 As incentive to keep watching, I've offered a "contest" on our Farm Facebok page (Wild Side Arabians). 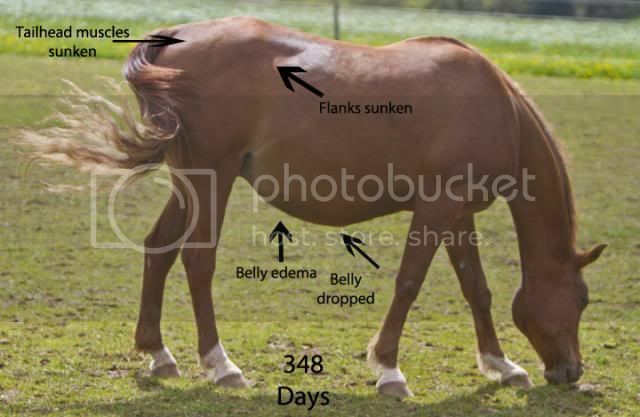 Name the date, time, gender & color of the foal and the winner will win an 8x10 print of one of my pictures. Just like our page and add your guess. 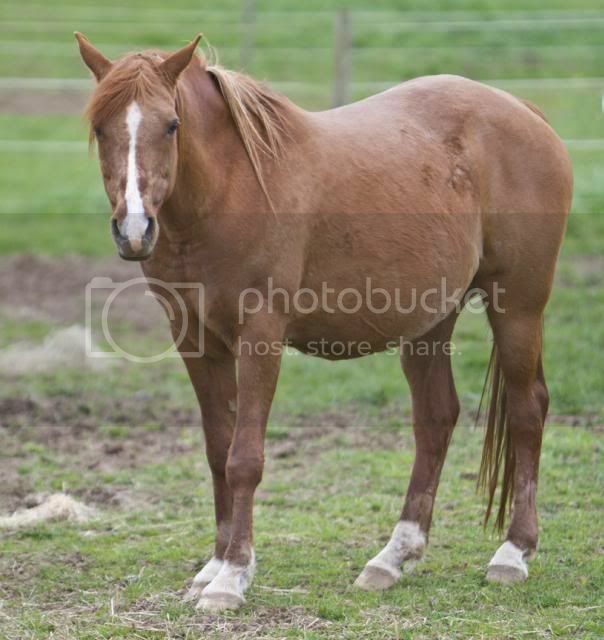 The back history: She is chestnut (AAee) bred to a heterozygous grey that was bay at birth. She had 1 breeding on May 10th, ovulation was confirmed that next morning. 340 days is April 15. Last pregnancy went 363 days. 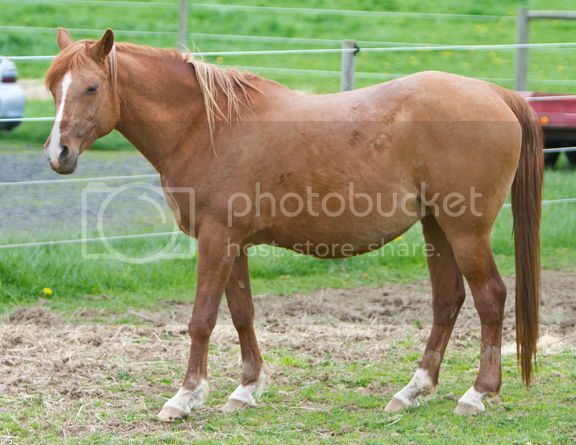 HAHAHA.....you want her in foal to Antham or not? ;). Well of course! If I'm gonna get an extra horse I can't afford I might as well have a fourth on the way too!!!!!! Can't wait to see this lovely baby. I don't have FB, but I'll take a guess anyway, if that's OK. I'll guess bay filly (to gray out), May 7th, 2:30 AM. Baskette looks great, BTW. I cannot wait to see this baby!!!! I'm hopin for a filly! Day 337 today....slight changes to her udder but nothing major. Sigh. She's gonna go long again. Although, with the weather we've had the last couple of days, that foal can just stay where its at. Cold, miserable, driving rain....blech. Complaining of cold, rainy, dreary weather -- haven't you just guaranteed the baby will come soon and very unexpectedly??? Looking forward to healthy baby and mama pictures, whenever the baby arrives! 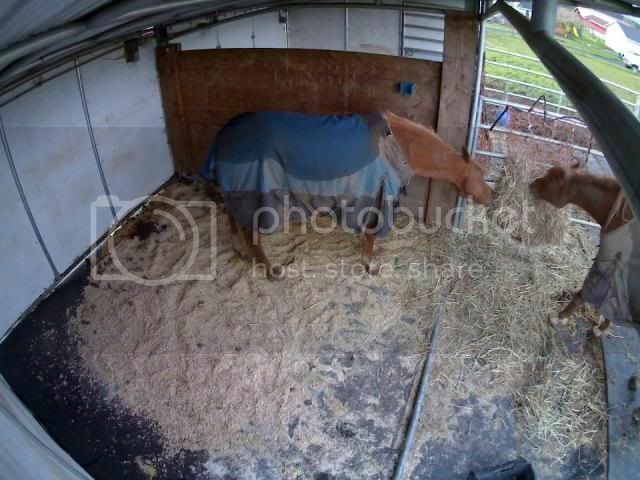 Camera on the foaling stall is up! We just need to rearrange the center partition and we're good to go. The wooden partition in this picture will be rotated 90* so she can be stalled in that covered 12x24 stall. i don't have the capacity to stream video like MareStare or anything, but we can at least record everything and post the video clips or stills. This camera has infrared as well. VOILA!! 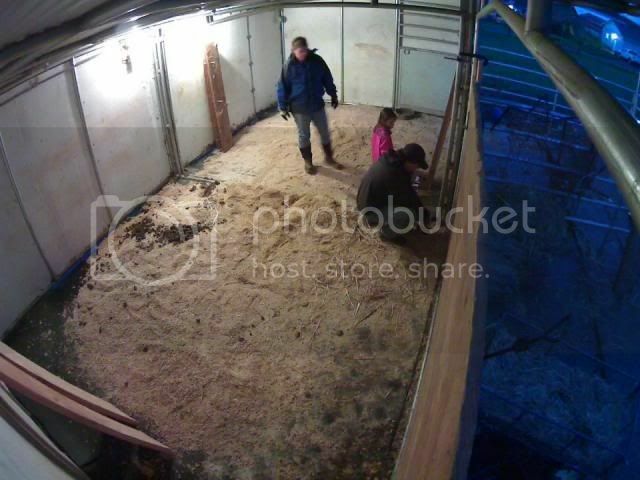 And then there was a 12x24 foaling stall with camera! I can't wait to see this baby!! She is looking good and yes there is a definite change in that baby belly. MAJOR changes overnight! Udder has doubled in size and I'm now able to get yellow sticky fluid out. Not quite milk yet though. 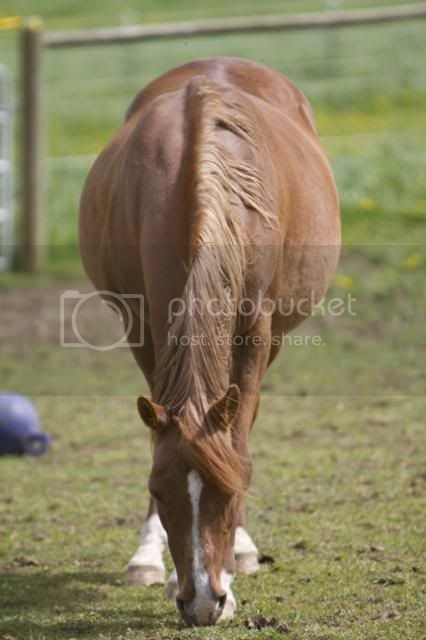 Belly dropped substantially, she is now gaunt over the flanks and tailhead, although she still has decent tail tone. She also lost her mucous plug. So we've bumped up the anxiety level a smidge. She's going to the "spa" this afternoon since its a lovely day out. Furminator treatment, bath, tail braid......Getting close!!! holy cow. (did she get to do the deed, ahem, personally LOL?) looking forward to seeing this baby! Nope....long distance romance, Man in a Can. :) She's in Washington, he's in Florida. If you get her to MN quick I can almost guarantee you a baby. We are in the middle of another delightful winter storm complete with heavy snow, wind, slick roads, the whole 9 yards. Don't mares like that kind of thing? Gotta love an April winter storm! Hopefully you get your beautiful baby soon! Come on! She just knows that we are DYING to see what she's cooking....man in a can...hilarious! Tell Baskette there's no need to wait for my birthday on Monday to drop this foal she's carrying... Anytime now is fine! we just got our first spring baby! and the other mare seems to be sulking because she wasn't first to the party LOL! Still nuthin.....She's had crystalline droplets on her teats yesterday & today, but not what I'd really call wax yet. She's as big as a house with a ton of leg & belly edema. And she no longer has a sense of humor. And probably has cramps in her ears from keeping them pinned. 348 days today. Just get ON with it....I do NOT want to have to break out the plunger. We're not quite to that point.....I hear the full moon is Thursday, so maybe that will help. Today's pictures, looking like a beached whale. Poor momma!!!!!!!! Was she this big with the last one?